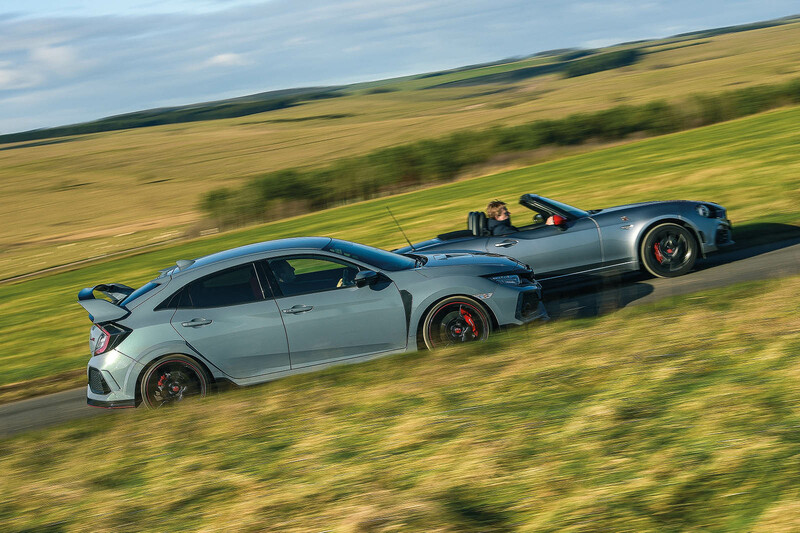 Honda Civic Type R vs Abarth 124 Spider: which is best? However much motoring journalists might wish that they did, car buyers tend not to think in straight lines. They don’t organise cars into nebulous classes and categories, then restrict their trawl only to those that populate the most relevant resulting constituency. Recently I had a conversation with someone agonising over whether to buy a Porsche 911 or a supercharged Range Rover Sport, and another with someone wondering if their life would be spiced more by a Ferrari 488 GTB or a light aircraft. Indeed, the only thing likely to be common to all candidates on any shopping list is that whatever is bought must fit within a fixed budget. So perhaps we should not be so surprised to see these two sharing page space here. 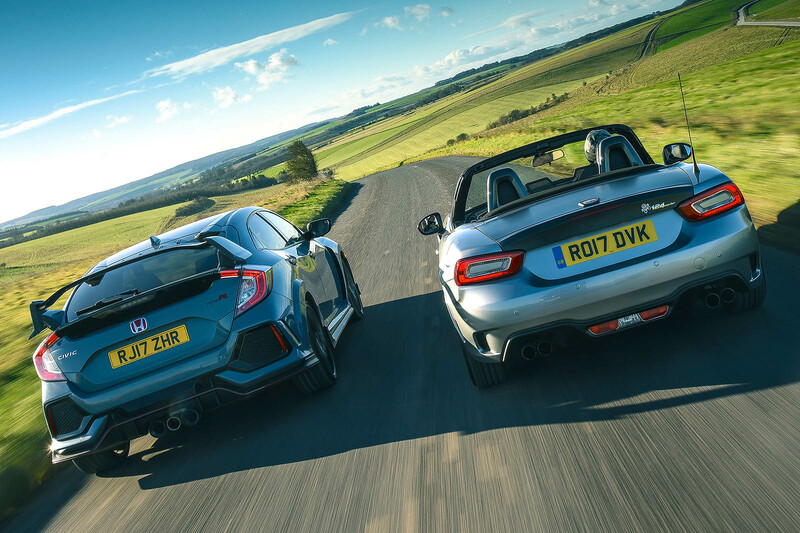 Conceptually, the Honda Civic Type R and Abarth 124 Spider might seem to occupy as much common ground as Corbyn and Trump, but both exist primarily for the provision of driving pleasure and either can be yours for within a grand of £30,000. Ergo, they are rivals. The appeal of this contest is that before they even met I could see exactly why the Civic was going to murder the Abarth. And vice versa. The Civic is wildly quicker and has breathtaking handling for a front-drive hatch, yet it will seat five at a push and has an enormous boot. Of course it’s the better car. Except that when it comes to the provision of pure driving pleasure, it’s not what’s on paper that counts but the road. And what hope could a fundamentally unbalanced car with incorrect-wheel drive and which is derived from something designed for shopping and the school run have against a super- light, two-seat, rear-drive roadster like the Abarth? Not much, it seemed. I travelled to the meeting point by Civic, marvelling aga the job Honda has done on this car while wondering once more why it had taken so many stabs at it before rediscovering the brilliance of the original Type Rs. I fear it knew all along but simply didn’t bother until it realised it could no longer fob off the public with cars that merely looked wacky and went fast. But this new model could only have come from a team that understood the old Honda, the car-crazy Honda, the Honda that remains the only Japanese manufacturer to win as a constructor in Formula 1. Among hatchbacks it is deft in a way a Volkswagen Golf R is deft, but where the Golf is happy to leave you merely slack-jawed in admiration of its abilities, the Honda picks up the corners of your mouth and yanks them towards your ears. It has the grip to make you giggle and a back axle that provides a degree of control and precision unbeaten by any similar car you can buy. Of course the Abarth is anything other than a similar car. It also has a four-cylinder turbocharged engine driving only two wheels through a six-speed manual gearbox, but that’s about all they share. The Abarth is as pure in its front-engine, rear-drive two-seat configuration as its parentage is complicated, a Fiat-powered Mazda built in Japan but wearing the badge of what was once one of Europe’s greatest tuning houses. And yet the Abarth has an essential rightness no car like the Civic could hope to emulate. In these days when most of us sit perched upon cars in order to provide a decent view out, we forget too easily the pleasure of being positioned so close to the road in a snug cockpit, surrounded only by essential controls. 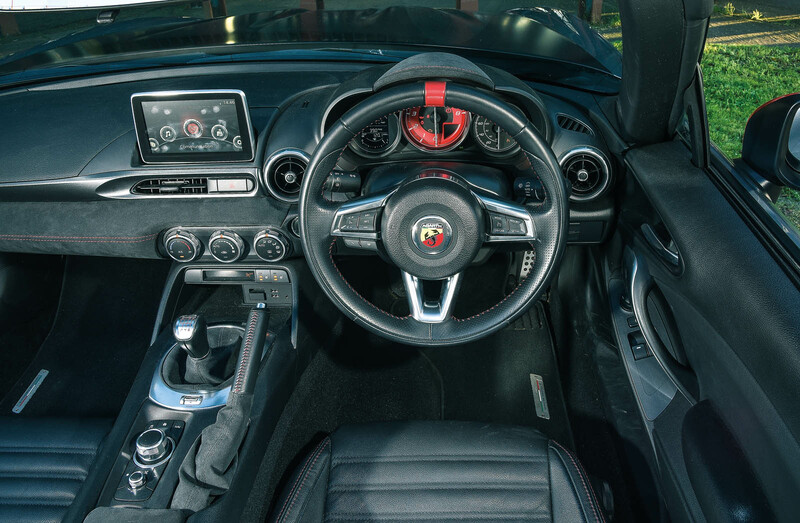 Even before you move an inch, the Abarth feels more sporting, more fit for this particular purpose: a car with a thoroughbred feel to belie entirely its mongrel origins. At least until you fire it up. The Honda motor is no songbird but it does for the most part spare you the curiously confected flatulence that greets an Abarth owner. Not for the last time you cannot help but let your mind flit back to the wonderful normally aspirated 2.0-litre motor Mazda uses in the MX-5 and sells for £5000 less. And initially it seems that the Abarth is a pleasant enough device, just not in any way that equips it to deal with the challenge of this contest. It has an excellent gearbox – better by far than that used by the Civic – and that lovely sense of immediacy offered by lightweight cars with close to a 50/50 front/rear balance. In the most literal sense, it places you at the centre of the action. But it rides only reasonably well, the steering somehow lacks the feel found in an MX-5 and that engine reminds you almost ceaselessly of the limitations of small-capacity turbos. By contrast, the Civic entertains from the off, not least because you need no more than a straight road and a twitch of a toe for the fun to begin. When you read that its 5.8sec 0-62mph time is a full second ahead of the Abarth’s, consider also it’s been achieved despite the traction limitations of front-wheel drive. Were it able to deploy as can the Abarth, you’d be looking at a time in the low fives or, in other words, a completely different level of performance that separates the agreeably quick from frankly bloody rapid. But then you witness something strange. You’re in the Abarth and attempting to keep up with a fast-moving Civic. You realise first that you cannot – no great surprise there – and then that it couldn’t matter less, because the moment you try to really drive rather than merely conduct the little Fiat, so does its character transform. Suddenly it feels sharp and alert. The engine may have its faults but a lack of low-down torque is not among them, and the more energy it injects into the chassis, the more alive the car starts to feel. Then its time for the Abarth to do things the Civic cannot. You notice its width, or lack of: it’s an incredible 142mm narrower than the Honda so you can take a proper line into corners the Civic can only drive around. Then you notice that, whatever you do, the nose always finds your apex, because whoever set up the chassis knew understeer has no place in a car like this. Finally, it offers the really good stuff in the form of endless opportunities to adjust your attitude using the other end of the car. With a standard limited-slip differential, gratuitous slides are available – but less satisfying than keeping it neutral enough to reduce the steering lock to zero degrees in either direction while powering out of a turn. Best of all, relatively modest grip levels mean it’s all accessible at relatively modest speeds. Briefly, the Civic feels a little leaden by comparison, feeling every one of the 320 additional kilos it must carry relative to the Fiat. It takes a while before it feels back to its best again, and when it does, you can’t help but realise this is a less interactive experience, where the fun derives more from marvelling at what it can do rather than what the two of you can achieve together. This doesn’t make it any less real but it does make you aware of the limitations of a heavier, front-drive design that simply don’t apply to the Abarth. But so too is there a trade-off here, and so before we can anoint a winner, we must take it into account. I’m not sure why I feel slightly surprised to say it, but ultimately it is the Abarth that is more fun to drive. The only problem is that you must drive it quite hard before it will take you to that other place of car and driver interaction the Civic cannot approach. By contrast, the Honda always keeps you amused. Whether tearing up the asphalt with a ridiculous turn of speed, or slicing through a corner as flat and fast as you might imagine any hatch could go, it is the consummate performer, its talents as broad as those of the Abarth are deep. All of which gives us a problem. Right until this point I was going to amaze you all and give the nod to the Abarth. It’s only when you drive a properly configured, traditionally arranged and genuinely lightweight sports car that you realise that for all the fastest of fast hatches have brought, so too has much been lost. But the Honda is just too good too much of the time. Yes, in ideal driving conditions the Abarth is the superior driving machine, but how often do we get to enjoy those? It has top-down appeal, too, but again, only when circumstances are right. 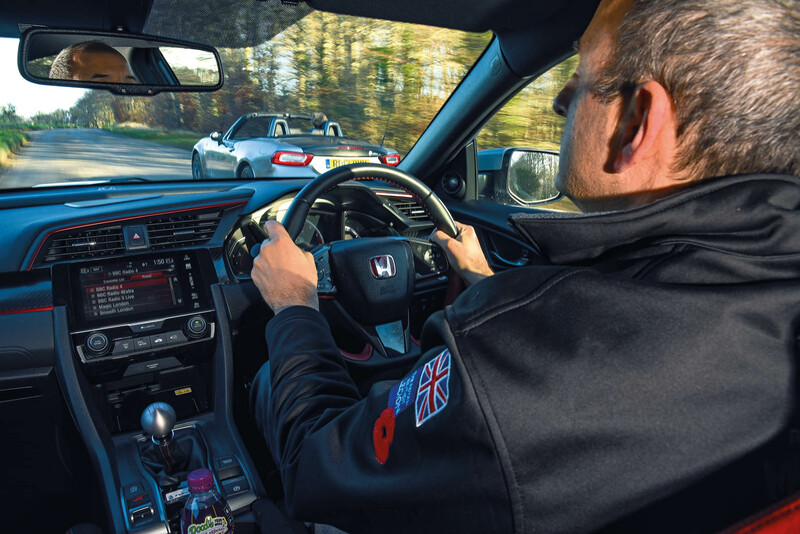 By contrast, and out there in the all-too real world, the Honda can always be enjoyed, whether it is wet or dry, the roads busy or empty and with one, two, three or four of you on board. So let’s give the moral victory to the Abarth and try not to think too hard about how much better even than this a far cheaper MX-5 would have fared. But the overall win belongs to Honda. 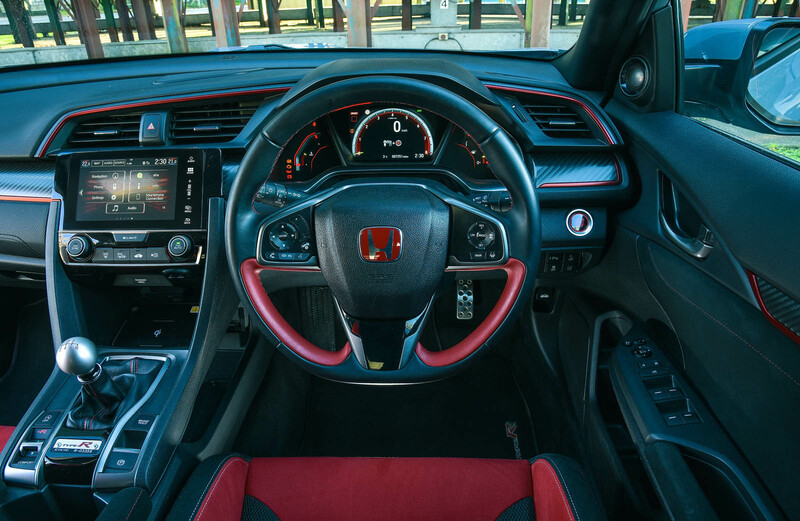 1st - HONDA CIVIC TYPE R: For drivers, it’s the best fast hatchback money can buy; for Honda, it’s a triumphant return to form. Just don’t mistake it for a proper sports car. 2nd - ABARTH 124 SPIDER: So much better than it appears on paper: a real traditionalist’s roadster and a proper driver’s car. With a better engine it could have won. MAZDA MX-5 2.0 SPORT: Had to be here, didn’t it? Slower than the Abarth but sweeter still thanks to its gorgeous normally aspirated 2.0-litre engine – and don’t forget that £5k price gap. VOLKSWAGEN GOLF R: The pragmatist’s hot hatch: a little less amusing than the Civic but a more civilised everyday car for sure. Still the best hot hatch all-rounder out there. TOYOTA GT86 PRO: It’s quite hard to spend £30k on a GT86. The stiffer, better-trimmed Pro gets you most of the way, but the base car is still the standout sports car bargain of its age. PORSCHE CAYMAN: Just £30k buys a lovely 2014, manual 2.7 Cayman – a mouth- wateringly delicious prospect for anyone after a daily driver that offers real genius on the right road. FORD MUSTANG: And not the weedy Ecoboost version, either. If you’re ready to haggle, £30k should be enough to secure all five litres of late-2015 Detroit bent-eight thunder. LOTUS ELISE: A nice, low-mile, 2016 example of a base 1.6-litre Elise – a car, if ever there were one, that proves it’s not what you’ve got that matters most but what you do with it. It's still fitted with Alfa's 1.4 turbo, I think. Not sure what Abarth could have done to it to make many motoring journo's dislike it. I had Guilietta fitted with and always thought it was quite a decent little motor. Its not an Alfa engine, its a Fiat engine. 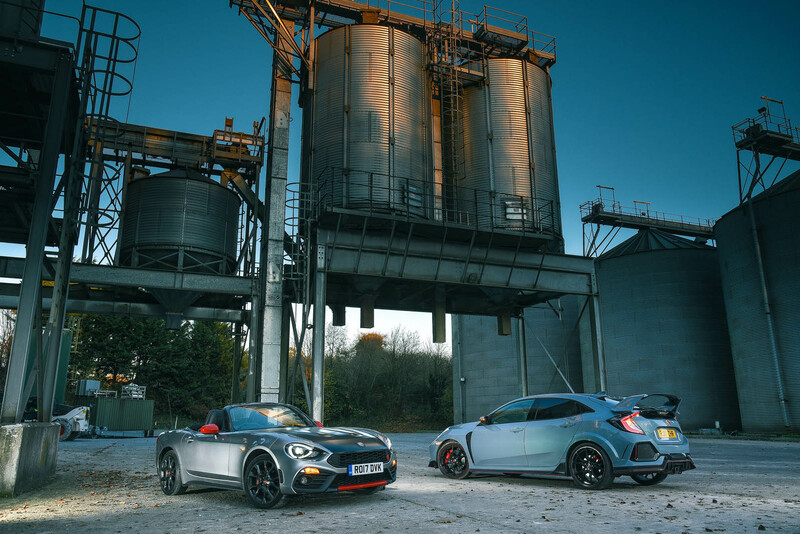 So a proper sports car can beat a hot hatch for fun, no surprises, but the hatch is more useable more of the time and easier to engage with, probably expected, maybe the mx5rf would have been a closer match and perhaps the gt86/brz could better the civic? Would anyone actually be deciding between these two cars? It would be nice if the Honda was a bit more handsome. The 1.75 engine would be pretty wild in the Abarth. Wonder if the result would have been different if they were driving from Monoco to Naples in the summer.